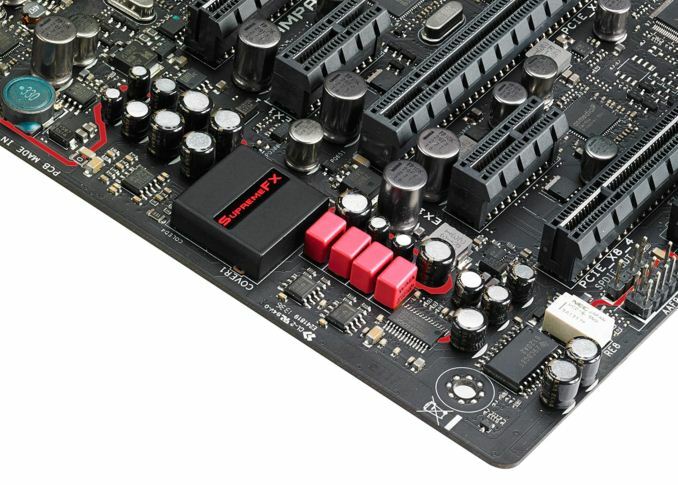 In the motherboard section of AnandTech, we rarely touched the audio section of the motherboard until fairly recently. Audio is a delicate issue, and knowledge on the subject falls into a wide range from the tone deaf all the way to the hyper enthusiast. Professional and prosumer audio equipment can be honed to perfection and cost an appropriate amount, where discussion on quality over $10k per meter cables can happen. 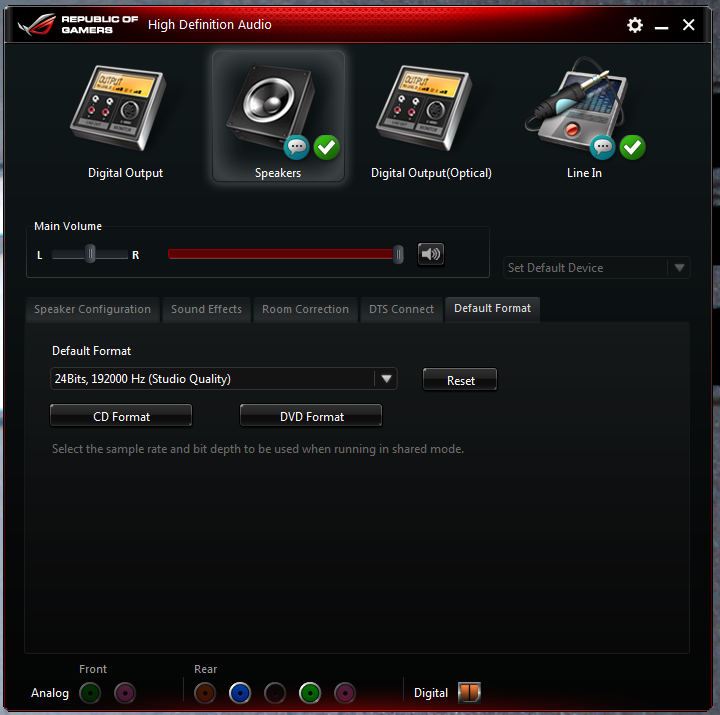 It is very hard to quantify an audio experience into a single set of rules, but as the motherboard arena can feature rather elaborate audio setups designed to enhance the quality or provide sufficient electrical filtering, and that these can be some of the major selling points, several of our readers asked us to start testing the audio. To put this into perspective, a motherboard manufacturer can create an audio portion of the motherboard that costs $2 to buy and implement. Another manufacturer will spend $20 to get a better audio codec and DAC, better audio filters, headphone amplifiers, and specifically separate the digital and audio traces on the motherboard as to reduce potential sources of interference, as well as focusing on a single output to achieve all this. Part of testing these scenarios is producing such a test that a reader can relate to, as well as a series of numbers for comparison to put in the review – both manufacturers and readers want to see that their hard earned engineering money and effort went into something that can be compared. In light of this request to test audio, looking into the best way to test it is a minefield. 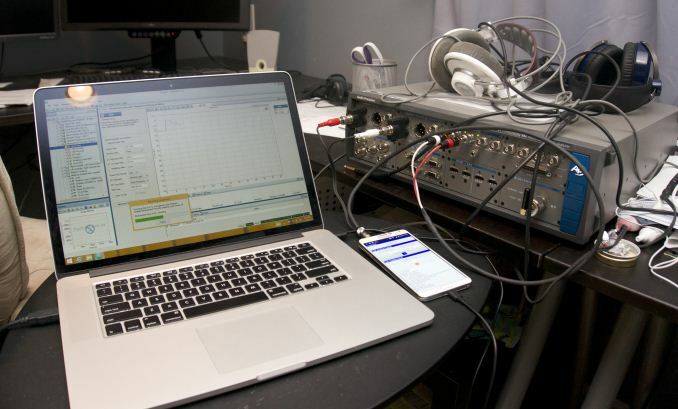 The correct equipment in order to get an accurate test of dynamic range, noise and distortion costs over $10k – for example, the audio equipment used in Chris Heinonen’s recent foray into smartphone audio testing was an Audio Precision APx582, which starts at eleven thousand. Audio Precision is often cited as the company that all audio manufacturers go to in order to test their hardware. Unfortunately unlike Chris I am not able to source Audio Precision testing equipment due to my location and contacts, but having the hardware on hand takes everything out of the equation except the audio generator and filtering pathway that a manufacturer decides to use. One ‘quick and easy’ test that has been in the mix and in several press pack guides is Rightmark: Audio Analyzer (RM:AA). This is a software solution to what is ultimately a hardware problem, and relies on the same hardware doing both the signal production and the signal receiving. This causes a number of issues, such as channel leakage, harmonic resonance in adjacent signals and that the limiting factor of the hardware being testing might affect other parts of the test. More often than not it is also difficult to compare results between products, due to input levels and driver settings. In order to provide accurate and comparable results, the software has to be explicitly set up for consistency and comparison, something a lot of reviewers that use RM:AA do not do. I must confess that for a while I was in this crowd. My RM:AA test was ultimately out of the box and produced wildly conflicting results. When audio solutions were quoted as 108 dB for signal-to-noise ratio were getting 92 dB, the conclusions were along the lines of differences in signaling and manufacture of the motherboard. In reality, the test was very wrong – the OS by default limits input/output to 16-bit + 44.1 kHz, producing an artificial ceiling, and the volume ratio of output/input in the testing loop was not standardized. While I kept the input/output the same, in fact each output of the audio jacks can have different responses to the audio in question. 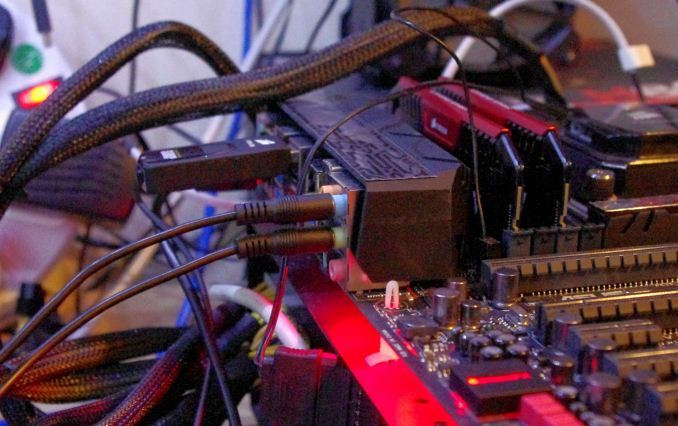 After delving further into the topic, we standardized the RM:AA test at AnandTech. The OS is now set to 24-bit, 192 kHz input and output (or the highest possible based on the audio codec options), the output volume was set to 100% and the input volume adjusted to provide accurate results without over-distorting the input. Ultimately our testing is still limited to the level of the input on the codec, often cited around 104 dB SNR compared to a 108 dB or 112 dB peak output, depending on what audio codec + DAC are used. Even when the same 3.5mm shielded cable is used or different tests, cable losses in a uncontrolled environment can be excessive (1-2 dB SNR), and my location next to a busy main road might also introduce error. This test is in no way perfect – we typically quote the SNR and THD+N (Total Harmonic Distortion + Noise) results as these were ultimately relevant to those who wanted cleaner and louder output, rather than a quality control test. 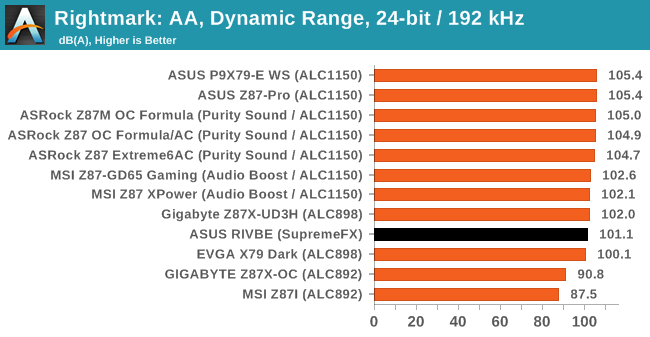 Recently we tested the ASUS Rampage IV Black Edition. In this review, we noted that for ASUS’ audio solution, they used their SupremeFX technology – a shielded audio codec with separated tracing, audio filters, headphone amplifiers and gold plated connectors. In this, ASUS use a Realtek audio codec to power a Cirrus Logic DAC, rated at 120 dB SNR and -107 dB THD+N. 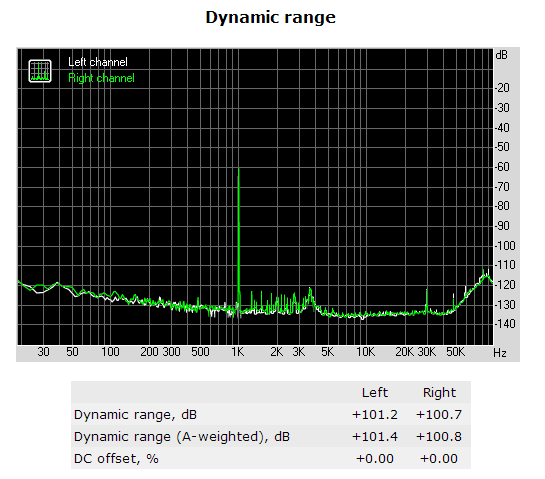 Our results were well below this in terms of SNR, ~95 dB, which is substantially lower. At the time I was unsure of the reason, and needless to say ASUS got back to me to confirm my testing methodology. 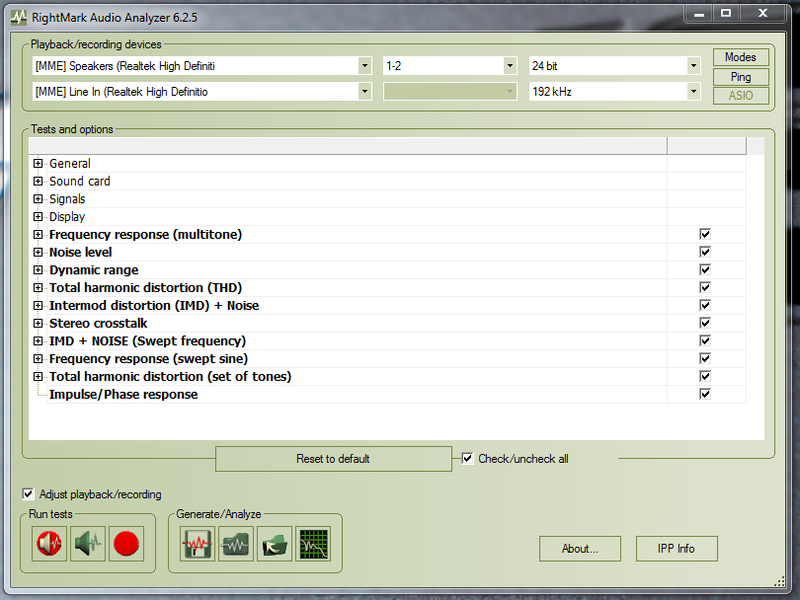 ASUS achieve a -108 dB SNR compared to my -101 dB SNR result due to ASUS using Audio Precision testing tools and my test using the Line In + RMAA methodology. The RMAA test also relies on a 1 kHz pulse at -60 dB for its test rather than a range of frequencies, which as a result causes the peak seen at 1 kHz. In light of the discrepancy, we are coming to a fork in the road for audio testing. I fall wholeheartedly into the ‘tone deaf’ part of the crowd when it comes to analyzing audio and prefer an easy-to-read number as a comparison, although I understand this is not the be-all and end-all when it comes to audio. Ideally I would like to use Chris’ setup for future motherboard tests. I have asked Chris to perform testing on a few select models if he has time in the future, which might be in the works. But I do not have access to an AP testing setup, and my current solution sits with RM:AA. ASUS has offered to provide their results in future press packs, although independent verification is what we want to report. In light of motherboard development we may see other manufacturers doing it also. In order to improve our reporting in this area, I will in future publish the SNR graphs we receive from RM:AA for comparison. Yes, but it is right next to the output on the motherboard so using that line as input is going to put more stress on the design of the audio components. A very realistic and honest look at audio testing. Ian, this writing has given me confidence that your future audio tests will be really worth reading. It's worth noting I think that 24/192 audio is good for audio testing, but is literally meaningless for playback. For example, audio with sampling rates above about 44KHz are useless -- not for "most people" or "for most speakers" or "in some expert's opinion" -- I mean mathematically provable that it has exactly zero benefit. Same goes for 24-bit audio (vs 16 bit). - You should still test at 44.1 or 48 kHz, because that is what everyone uses. Do games even use more than 22 kHz samples now?